Modern and stylish, this Lanart Rug Outdoor Shag area rug is a quality accent piece. Keep the contemporary look in your home with this indoor/outdoor piece crafted from plush synthetic material. Durability is key with this area rug. This item is the epitome of modern style with its patterned design. Outdoor rugs can be colourful or neutral, depending on your style preferences, and are very beneficial accessories to bring home. Outdoor rugs instantly warm up any area needing a little colour or texture. And they do it without taking up extra space. From the front door to your backyard patio, consider where your home could benefit from cozy decor. You want your new decking to last years, so extend the wood's life by throwing down a protective rug. Rugs are easy to replace when worn out, whereas new wood or concrete require a large amount of your time and money. If your patio, porch or deck flooring already shows signs of damage, cover up the stains and water spots with your rug. A large outdoor are rug can hide cracks in the concrete and other types of damage easily, preventing you from having to make any repairs to your flooring right now. This beautiful bright and colourful outdoor rug is accented with the most on trend patterns available this season. The reversible outdoor mat is perfect for a picnic at the beach, or on a deck underneath a patio set, ready for your guests. This outdoor rug is made from 100% polypropylene. It easy to clean, as you just need to hose it down. Bring this mat to the beach with no worries, its UV stabilised and wont fade with the sun. Beautiful, versatile and weather-resistant, the Indoor/Outdoor Four Seasons collection combines the benefits of outdoor functionality with the style of indoor fashion. The colour palette is lush with nature-inspired neutrals, soft greens, and rich reds while the transitional designs are perfect for your casual lifestyle. Bungalow Palms is going to remind you of a tropical getaway all year round. The beige background and the blue, green, tan and bronze palm leaves that lay over it make for a great earth tone palette. You can spice up any dicor with this rug! Outdoor Shag Green 5 ft. x 7 ft. Indoor/Outdoor Contemporary Rectangular Area Rug Modern and stylish, this Lanart Rug Outdoor Shag area rug is a quality accent piece. Keep the contemporary look in your home with this indoor/outdoor piece crafted from plush synthetic material. Durability is key with this area rug. This item is the epitome of modern style with its patterned design. 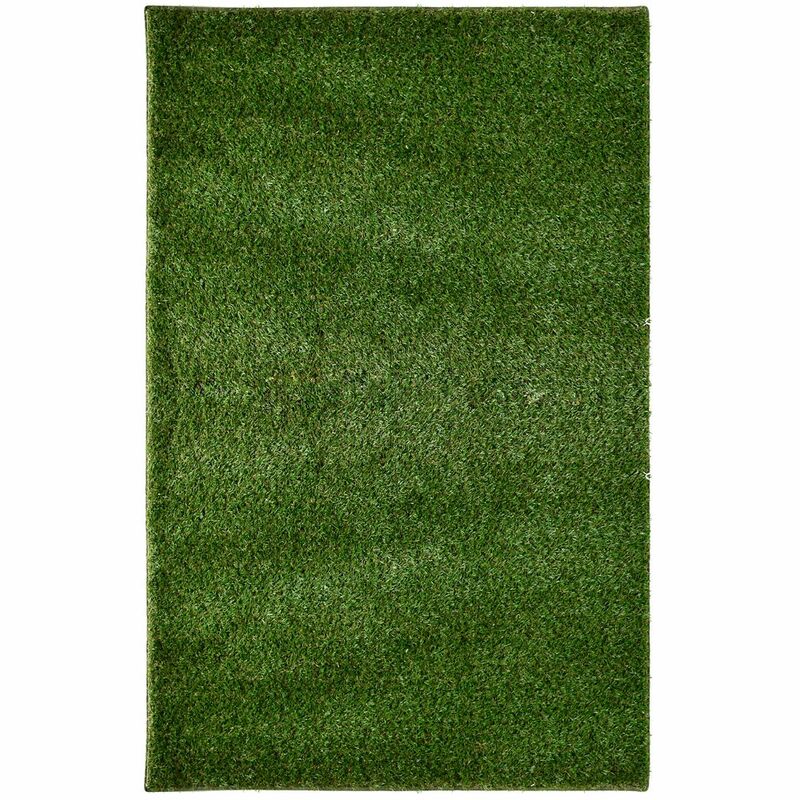 Outdoor Shag Green 5 ft. x 7 ft. Indoor/Outdoor Contemporary Rectangular Area Rug is rated 4.6 out of 5 by 7. Rated 5 out of 5 by craftlady1565 from We have a 3-story house with back decks, and we... We have a 3-story house with back decks, and we have a puppy who is house broken, but would not do her business on the outside upper deck at night, and I would have to take her all the way downstairs and out to the grass. This became a nuisance, so we bought the rug (which looks and feels awfully close to real grass), and put it out on the back deck. She now has no problem whatsoever using it at night and saving me long trips down the stairs. It drains perfectly and hoses off easily when we don't have any rain. Love it. Perfect for our purpose! So glad we bought it! Rated 5 out of 5 by Dio from Love it... more than I thought I would!... Love it... more than I thought I would! Rated 5 out of 5 by dbadeb from This shag green indoor/outdoor area rug is perfect for what we needed. The rug matches the exact ... This shag green indoor/outdoor area rug is perfect for what we needed. The rug matches the exact color of the grass nearby, very beautiful next to our spa and carpet like, We absolutely love it. Rated 5 out of 5 by Peyton from The rug is exactly what I hoped and anticipated! I... The rug is exactly what I hoped and anticipated! I love ti every time I step on it! Rated 5 out of 5 by Lizz from This grass looks amazing!... This grass looks amazing! Hello Thunderbunnie! This rug is perforated and allows water to drain. The rug should be aired out in order to diminish the chances of any damage. Can this rug be cut to size?